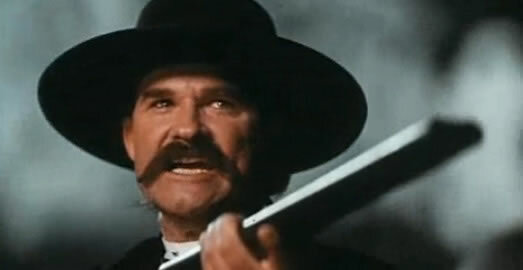 TOMBSTONE has its claim-to-fame line “I’m your Huckleberry“, cooed by Val Kilmer’s ‘Doc Holliday’ as he baits ‘Johnny Ringo’ (Michael Biehn), but there are a passel of tough, witty dialog gems peppering this umpteenth Earp/Clanton extravaganza. Kilmer deserved an Oscar nomination for his tormented and deadly dentist. He’s matched in intensity by Kurt Russell’s ice-eyed ‘Wyatt’. The cast is jam-packed, with special honors going to bad guys Powers Booth and Stephen Lang—but boy howdy, you have Sam Ellliot, Bill Paxton, Dana Delany (out of sync), Thomas Haden Church, Jason Priestley, Joanna Pacula, Michael Rooker, Billy Bob Thornton, Billy Zane, John Corbett,—and to honor the genre and old-timers, cameos from Harry Carey Jr. and Charlton Heston, with some open & close narration courtesy of Robert Mitchum. That swarming cast indicates maybe some clutter, and even at 135 minutes it feels both stuffed and unfinished. The first two thirds work best, but then it trips on its spurs with overkill(ing), rushed incident and just plain made-up stuff. Who decided on all the guys-riding-pell-mell-shooting-directly-at-the-camera malarkey? Unfortunate, after Kurt’s flint-tough lawman and Val’s brilliantly decaying gambler, that the script and direction get lazy. It was a troubled production, with over 100 people quitting or getting canned. Russell ended up doing most of directing while giving a ‘ghost’credit to a guy with a poor track record, George P.Cosmatos, while much of an even lengthier script was cut out. Still and all, a worthy 1993 entry, especially for fans of the genre. Regarding Val & Doc—Kilmer was left out of an Academy lineup of John Malkovich (In the Line of Fire), Pete Postlethwaite (In the Name of the Father), Ralph Fiennes (Schindlers List), Leonardo DiCaprio (Whats Eating Gilbert Grape?) and winner Tommy Lee Jones (The Fugitive ). It’s hard to take anything away from Jones, but I think Val was better (Leo aced them all, truth be told). Holliday is no-lose showcase—as proven by Victor Mature (My Darling Clementine), Kirk Douglas (Gunfight At The O.K.Corral), Jason Robards (Hour Of The Gun),and perhaps best of all, Dennis Quaid (Wyatt Earp).